This bus stop shipped totally assembled! At site just anchor to foundation and it's ready to go. 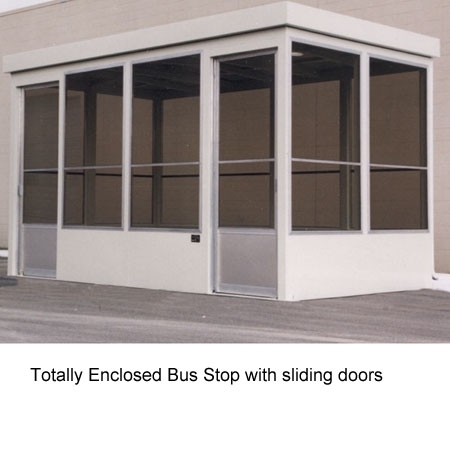 featuring totally enclosed sides and twin sliding doors this unit will keep patrons out of the wind, rain, and snow on the worst of days. Options include signage, outside lighting, solar powered lighting, air conditioning and heat. Panic Buttons can be added for connection to security systems. Each bus stop starts from scratch so we can offer blank walls, swinging doors, benches, two-tone paint, or whatever you might need for your location. Just give us a call or send us an email, we will be happy to discuss your project.